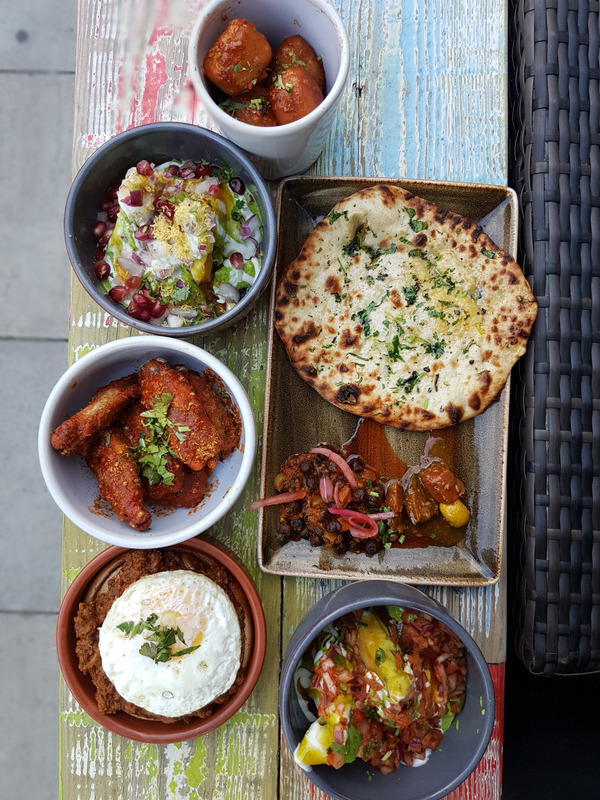 I’ve reviewed a few new Indian style tapas restaurants lately, ‘Chai Thali’, ‘Hankies’ and ‘Talli Joe’ to name a few and ‘Chai Naasto’ is the latest addition to a growing trend of new Indian restaurants that focuses on sharing small plates. 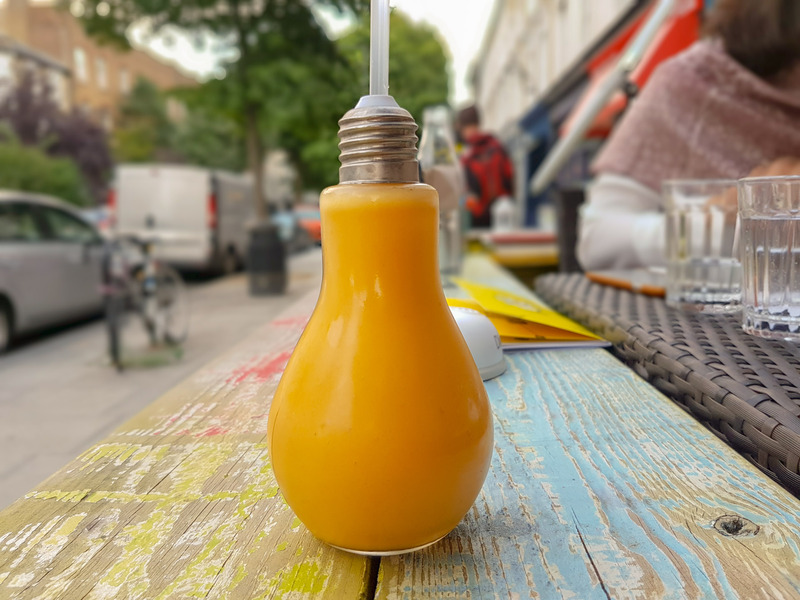 Chai Naasto is located in a very residential area in Hammersmith, about 7 to 8 mins walk away from the station. It’s sandwiched between houses and flats, relying on a lot on local custom and walk-ins. 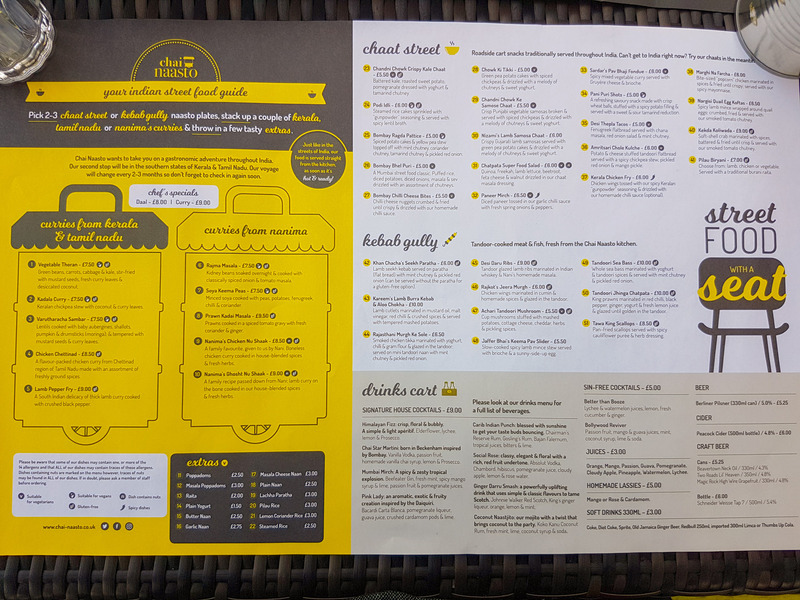 The menu offers a wide range of items, I was very surprised to see just how many items there were on offer. It made the task of ordering a tricky one for myself, and the other 3 in my group. We actually spent around 30 mins deciding on what to eat. 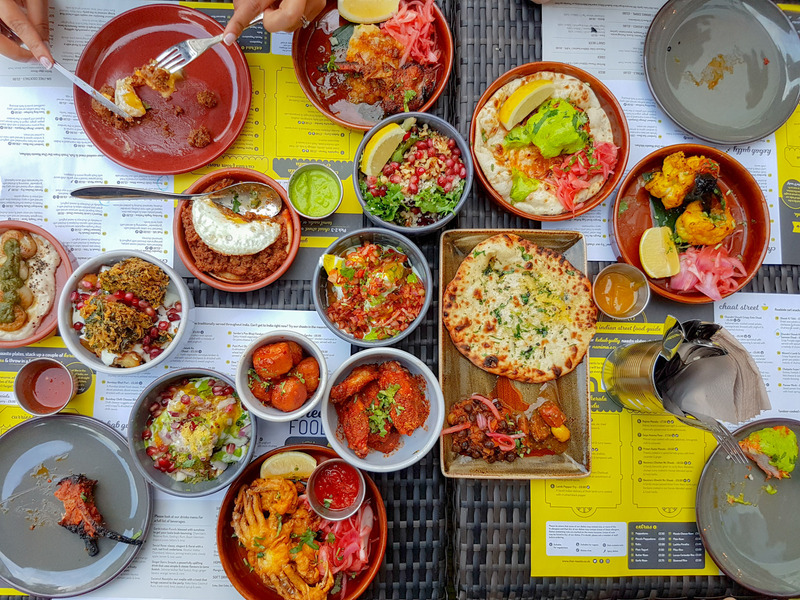 In true fashion, we ordered WAY too many small plates and were left with no room to try any specials or curries. I’ve been to a lot of restaurants to eat, but I have never ordered nor tried so many different items before. I tend to write my reviews a few weeks after the visit so I can think about what to write, but writing this is very hard as we tried so many things…! Let’s try, so below is a list of everything we ordered and my thoughts on the items I managed to try.. 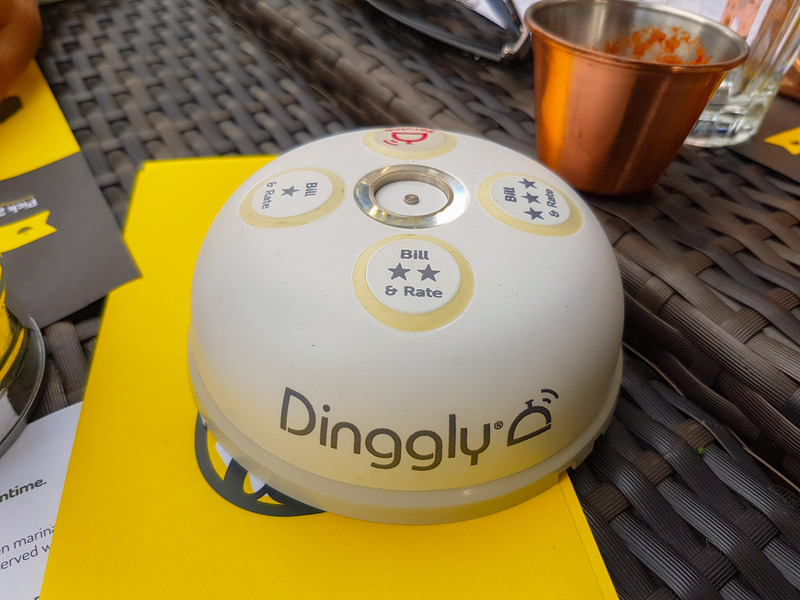 When sitting outside, you have a little call the waiter button. Every place should have this! 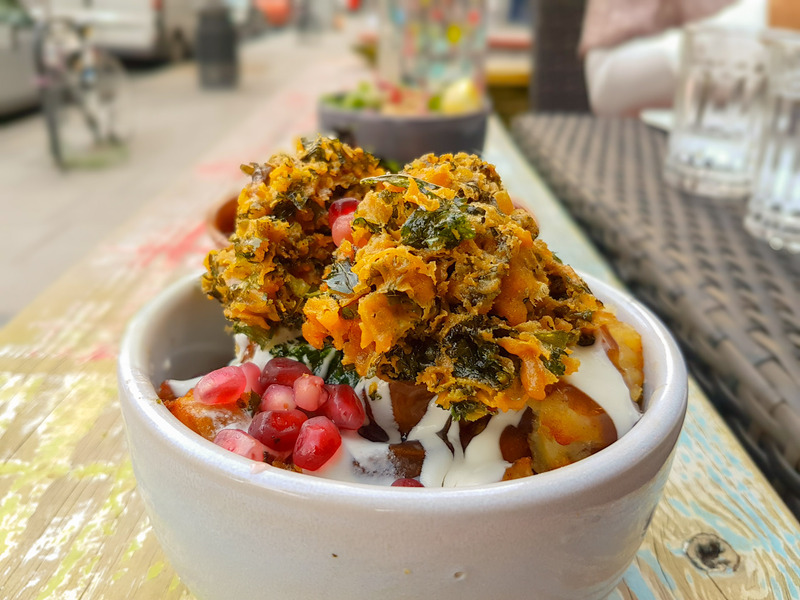 I had the kale chaat from ‘Talli Joe’ and loved it, so was hoping for something similar, however this was not the same, sure the texture was there but the taste sadly, was not. The kale pakora was too dry inside and not particularly well-seasoned. The chaat that it came in was the same in several of the other dishes we ordered. 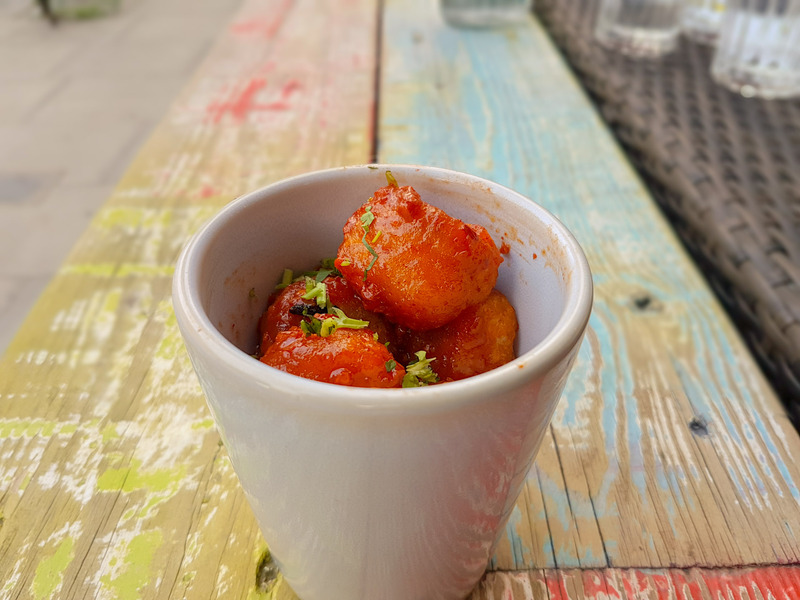 Chilli cheese nuggets crumbed & fried until crispy & drizzled with our homemade chilli sauce. I liked these: they were gooey and warm and comforting, with the melty cheese oozing as you bite into the nuggets. It’s what I like to call dirty food – something that you know is full of stuff that’s bad for you, but you don’t care, because it tastes good. However, I didn’t get much chilli coming through. I assume the chilli was supposed to come from the sauce that the nuggets were doused in, but to me it just tasted overly sweet and gloopy. Covering the bites with it meant that they lost the crispness they were supposed to have and instead came out soggy and overly sweet. 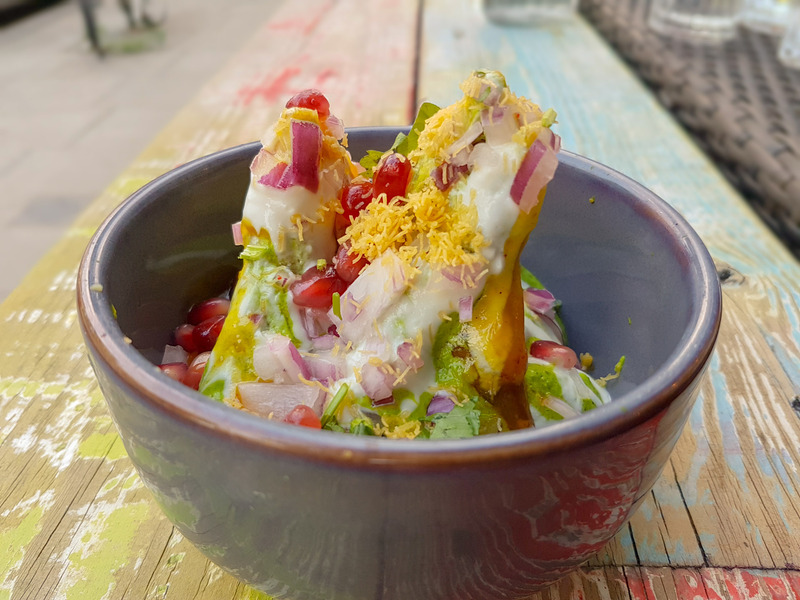 Crisp Punjabi vegetable samosas broken & served with spiced chickpeas & drizzled with a melody of chutneys & sweet yoghurt. As with the lamb samosa, I didn’t understand why these came half-immersed in a sweet and sour chaat mix. The filling of the samosa, for me, got lost in everything else that the samosa came in. 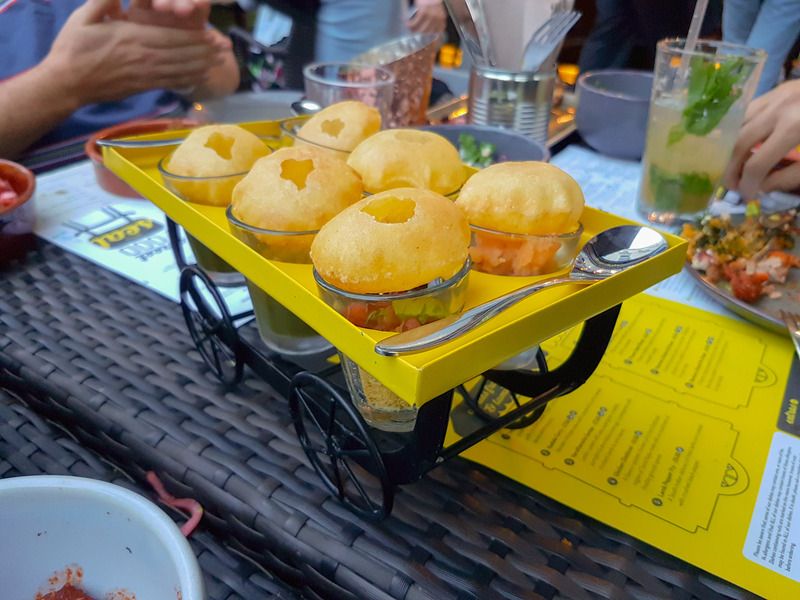 I assume there was potato inside the samosa, but as there was also potato in the Bhel Puri/chaat, it all just melded into one big chaat dish and the samosa got lost in it all. Crispy Gujarati lamb samosas served with green pea potato cakes & drizzled with a melody of chutneys & sweet yoghurt. The samosa was nice, with a good amount of keema filling. However, I didn’t understand the need to douse half the chaat street dishes in a chaat mix. It rendered them all very similar in taste and meant that what was supposed to be unique about each dish actually wasn’t very noticeable. All this did was turn the crispy filo pastry of the samosa soggy and meant it got a bit lost amongst all of the chaat ingredients. 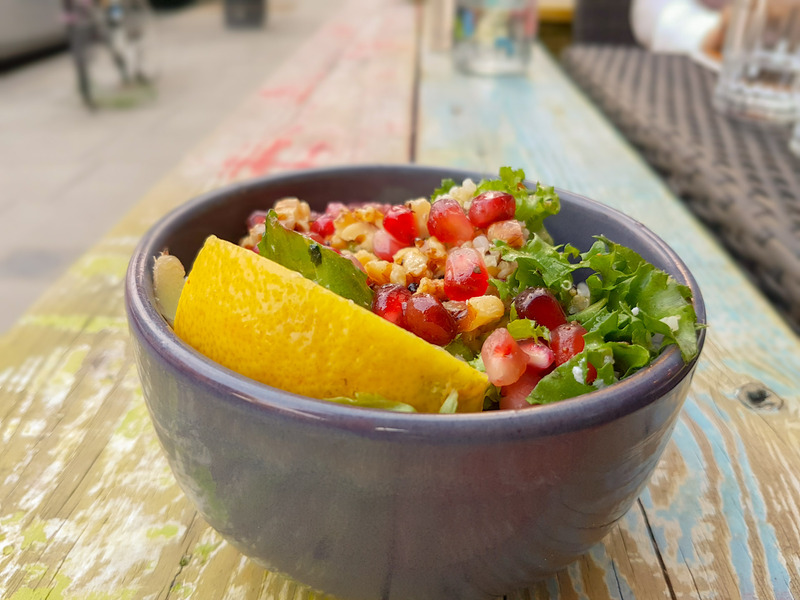 Quinoa, freekah, lamb lettuce, beetroot, feta cheese & walnut drizzled in our chaat masala dressing. I didn’t try this… or maybe i did… I can’t recall. A refreshing savoury snack made with crisp wheat balls, stuffed with a spicy potato filling & served with a sweet & sour tamarind reduction. 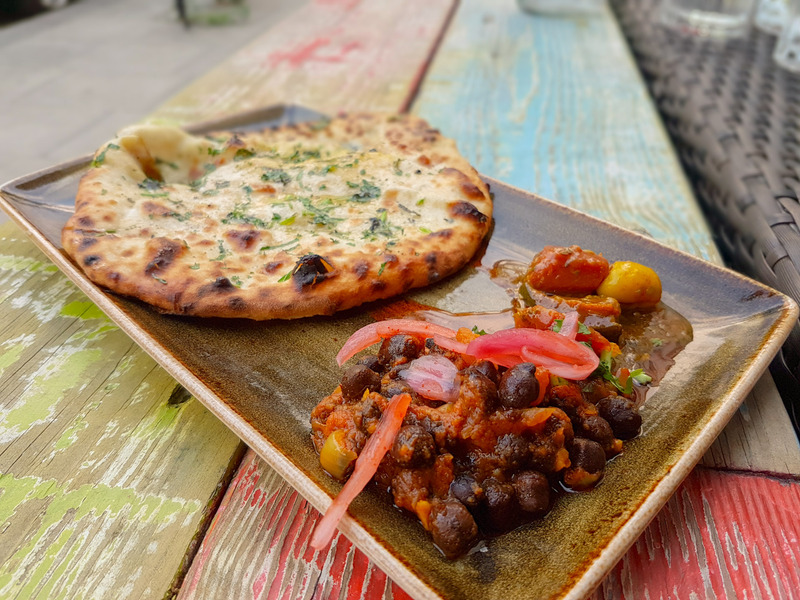 Potato & cheese stuffed tandoori flatbread served with a spicy chickpea stew, pickled red onion & mango pickle. Didn’t eat this…. I can’t remember so enjoy a picture. 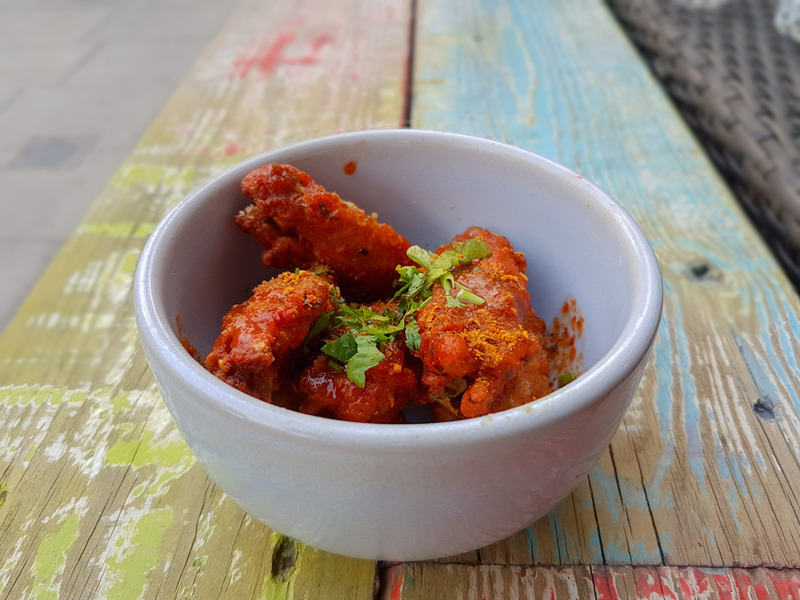 Chicken wings tossed with spicy Keralan “gunpowder” seasoning & drizzled with our homemade chilli sauce (optional). Indian KFC! It’s basically Indian fried chicken! What’s not to like about this dish, the spices in the breading worked really well – I liked this simple but effective dish. 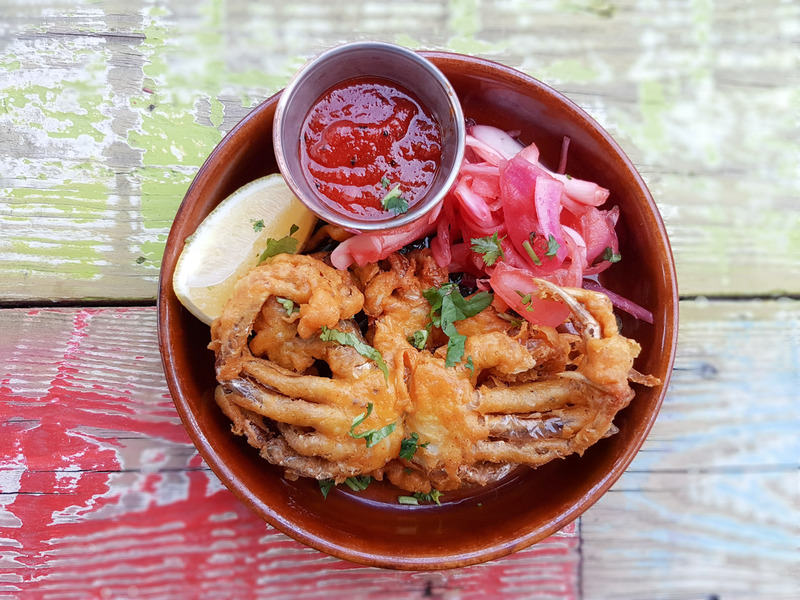 Soft-shell crab marinated with spices, battered & fried until crisp & served with our smoked tomato chutney. For me, my favourite dish of the night, the presentation looked beautiful and the light crab as perfectly cooked and was equally as good as the texture of the delicate batter – great use of spices and flavours. Lamb cutlets marinated in mustard oil, malt vinegar, red chilli & crushed spices & served with tempered mashed potatoes. 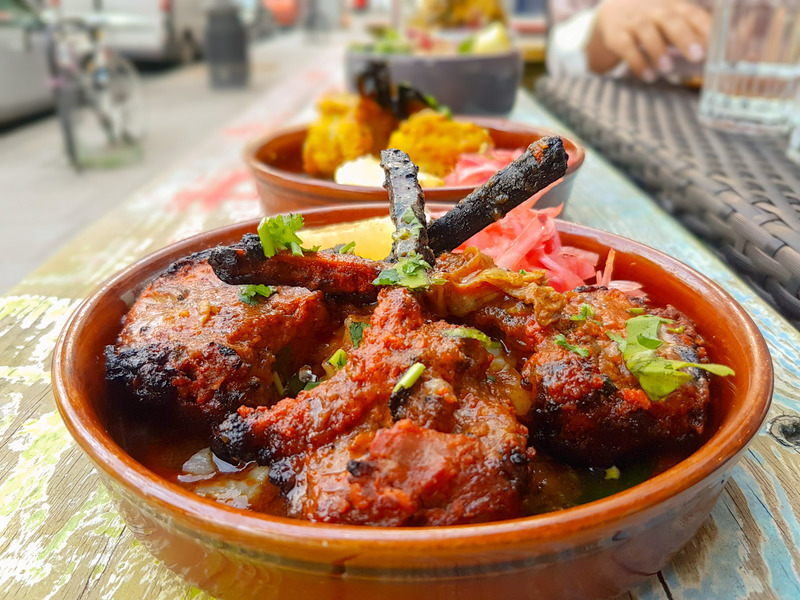 Lamb chops are my favourite things to order at a restaurant – these were cooked medium well, so slightly overdone in my book, I prefer medium; so it’s juicy and tender. The flavours were subtle and the mash potatoes that came with the dish was an interesting addition that worked really well. 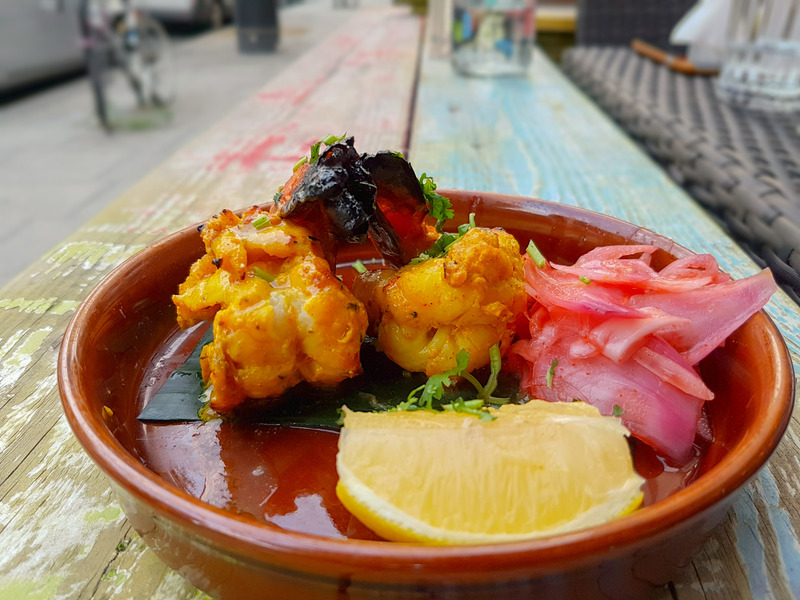 King prawns marinated in red chilli, black pepper, ginger, yogurt & fresh lemon juice & glazed until golden in the tandoor. At £10, I feel this plate could have come with more than two prawns on it. Yes, the two prawns we got were fairly large, but between four of us, it meant an average of half a prawn each. 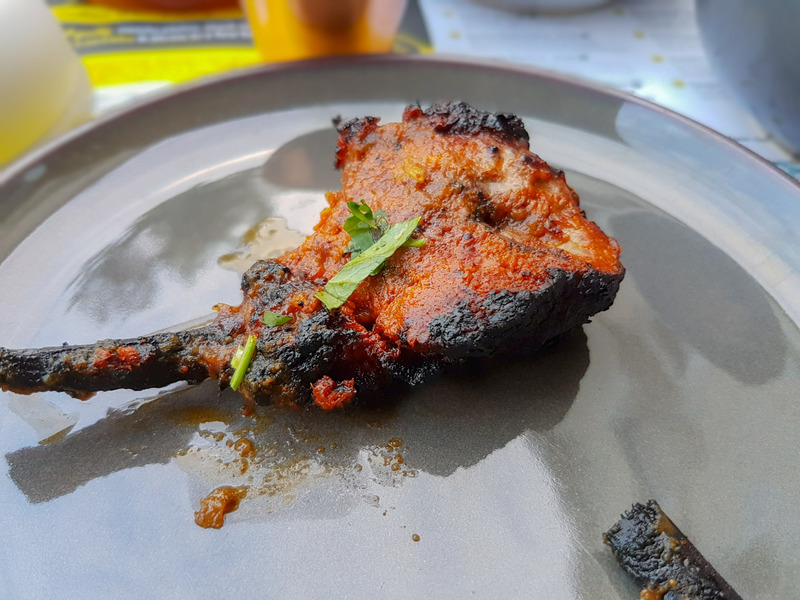 The bigger upset is that they were neither juicy nor spicy and the golden colour on them seemed to be more from the addition of turmeric than from being cooked in the tandoor. 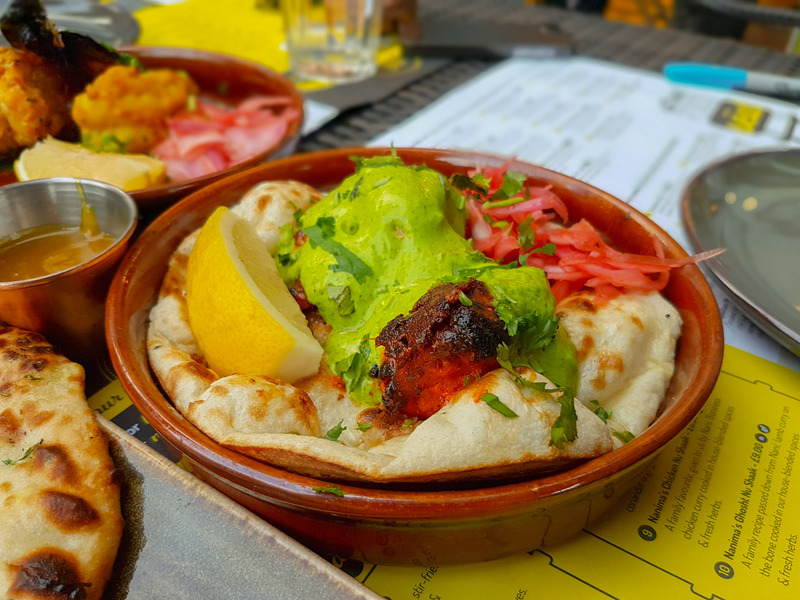 I found the prawns to be dry and bland..
Smoked chicken tikka marinated with yoghurt, chilli & gram flour & glazed in the tandoor; served on mini tandoori naan with mint chutney & pickled red onion. 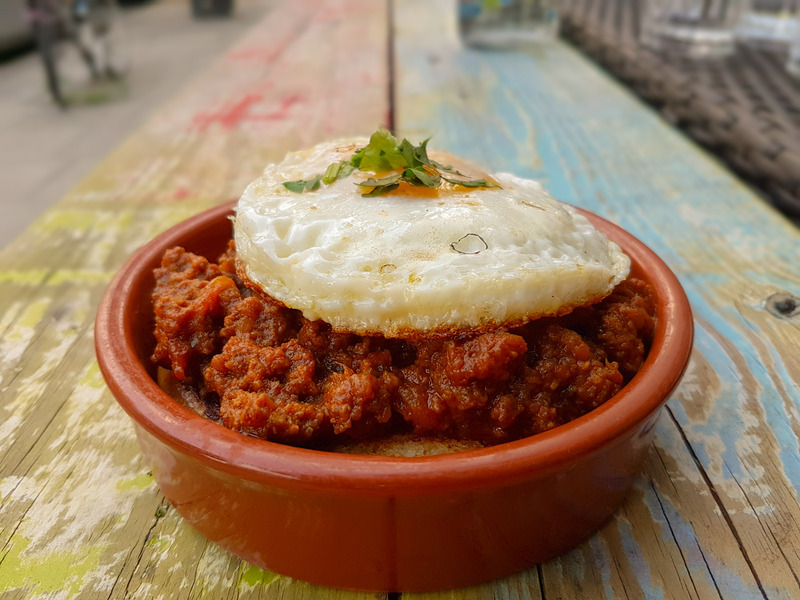 Slow-cooked spicy lamb mince stew served with brioche & a sunny-side-up egg. A very nice dish, the keema was lovely, with a good level of spice and masala to it. 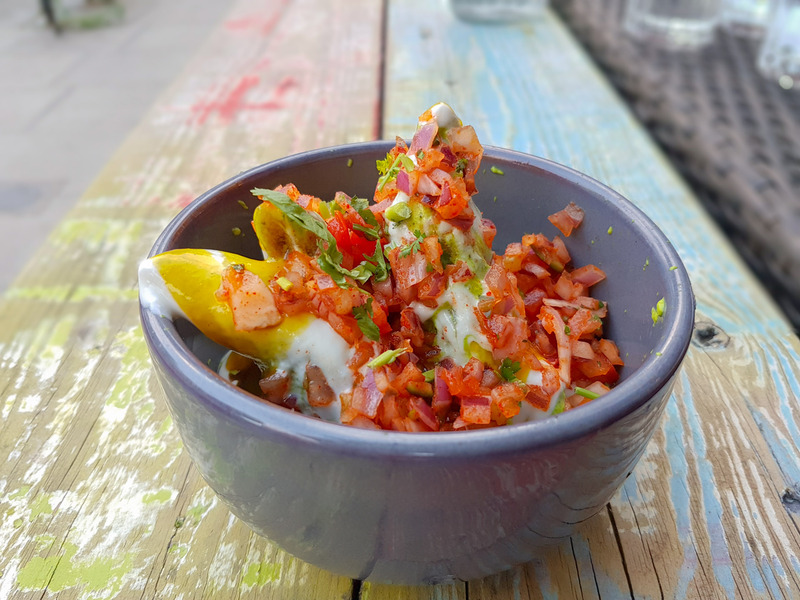 The fatal flaw was in the egg, which should have come with a runny yolk that, upon breaking, seeped into the keema and could be mopped up with bread. Instead the yolk was overdone with no sign of golden runny-ness! Additionally, I’d have preferred the brioche toasted and on the side. Placing it under the keema rendered it soggy and difficult to cut/tear. Why not leave it separate and allow the customer to pile the keema and egg on themselves? That way it won’t be soggy before it’s even reached the table. 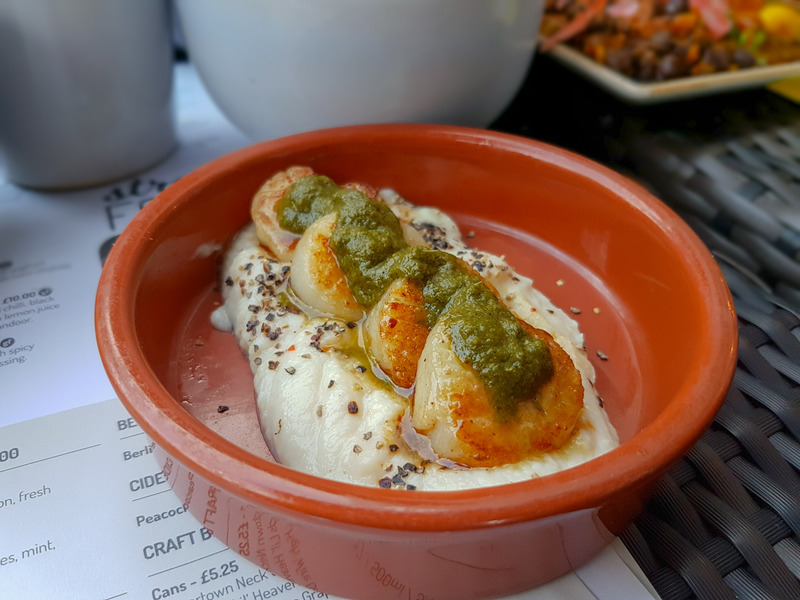 Pan-fried scallops served with spicy cauliflower purée & herb dressing. I have become a fan of the mighty scallop, these were cooked well, however, slightly smaller than a regular king size scallop. The cauliflower purée & herb dressing went well with the dish but needed more use of herbs and spice as the flavour was subtle. Filo pastry filled with white chocolate, served with vanilla ice-cream & raspberry coulis. Surprisingly tasty. Crisp and light – a welcome dessert after a heavy meal. An indulgent, spiced chocolate orange brownie served with vanilla ice-cream, salted caramel & toasted nuts. 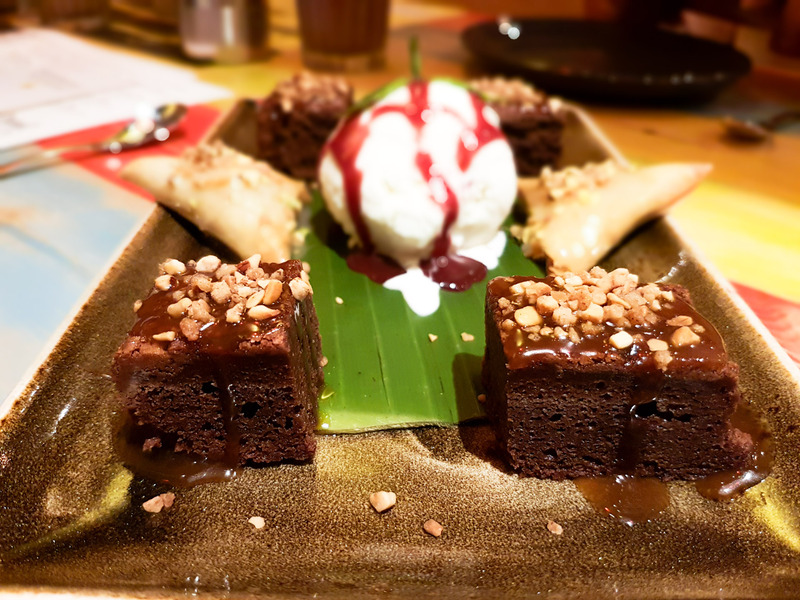 The brownie was dry inside and the spices – predominantly cardamom – overwhelmed the dessert, leaving a barely-there hint of orange, or indeed chocolate. Not great. 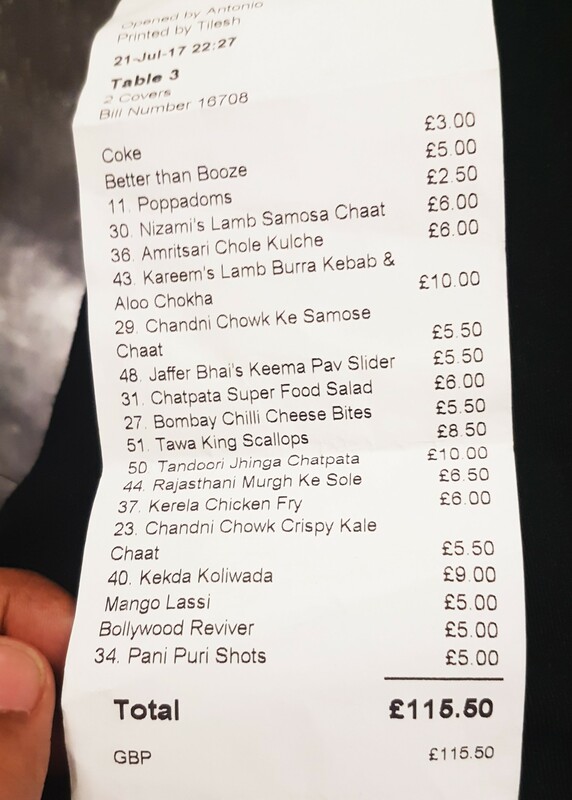 The total bill was £115 for 4 people with drinks. Which, based on the amount we ate was worth it I think. Overall I feel that most of the dishes lacked enough spices which reduce the overall flavour and also lacked heat from chillies. I feel that the food has been catered for the local clientele of the area. The food all looks beautiful and none of it was bad, but equally, none of it was amazing, the stand out dish was the crab and I liked the Indian fried chicken. 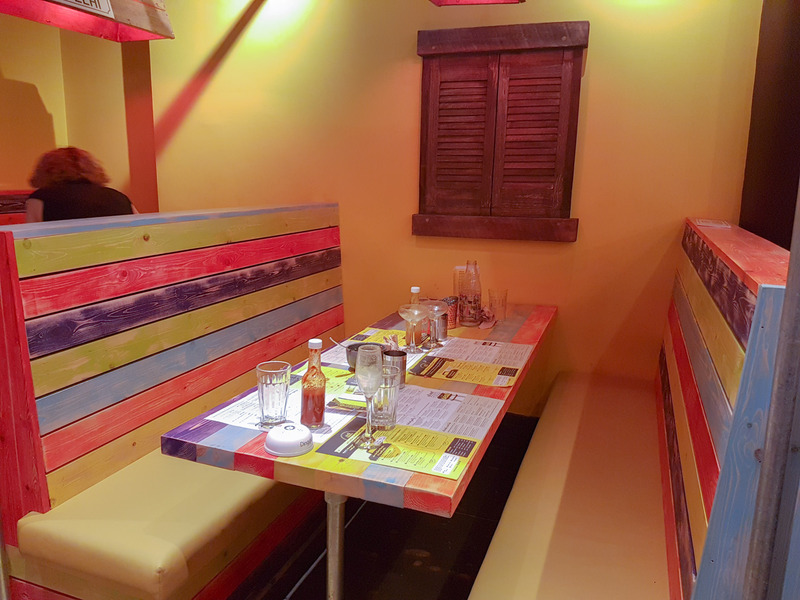 If we had not over ordered then we would have gotten to try the curries, so it’s a shame we didn’t have space. But none of the food we ordered was wasted, we finished everything. 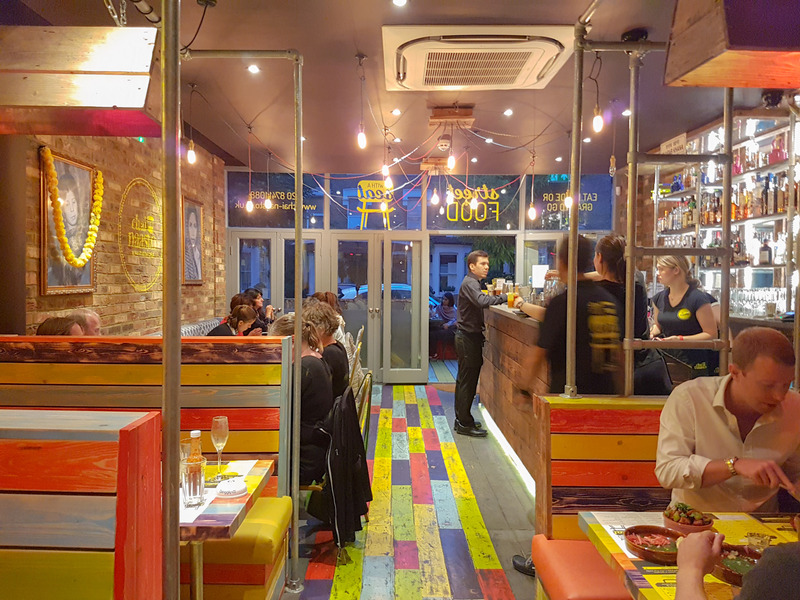 It’s an extensive menu, making it great if going in a big group, as you can try more. 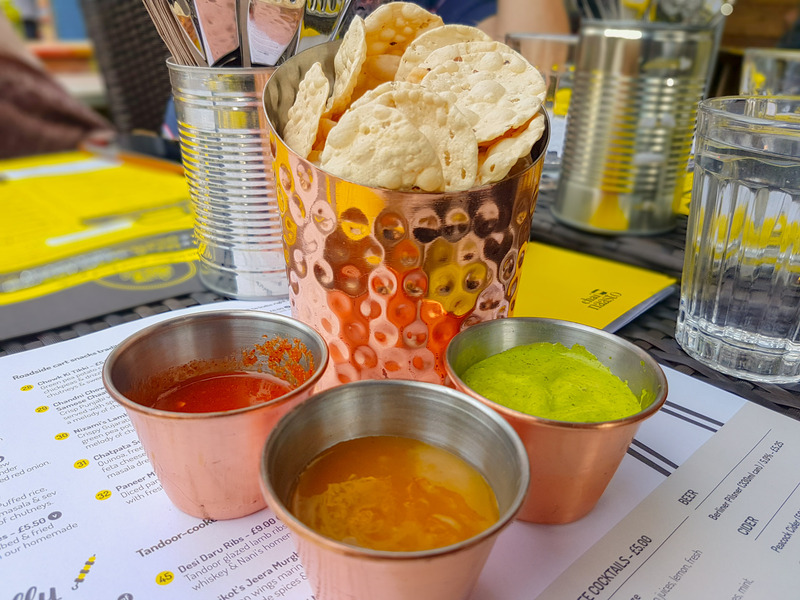 There is a plan to change the menu as it moves through the different food and cooking styles of the Indian subcontinent every few months. I was invited to review here. The meal was complimentary. same interest.If you have aany suggestions, please let me know. Hey Buddy!, I found this information for you: "Chai Nassto". Here is the website link: http://halalfoodguy.co.uk/chai-nassto/. Thank you.